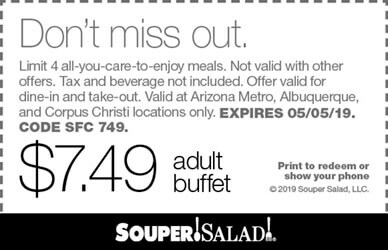 Souper Salad is offering their famous lunch or dinner salad buffet for just $7.49! Simply print this coupon and present it to your server to get the deal. No beverage purchase required for this offer. Here’s your chance to enjoy healthy, delicious soups and salads, all at a most appetizing price! Coupon valid for up to 4 people, dine-in or take-out. While you’re there, be sure to register for the Souper Fresh Club. You’ll earn valuable points, redeemable for rewards on future visits.